Freezing is a natural process which does not require the use of preservatives. Freezing fish and seafood results in premium quality all year round. Using frozen fish and seafood allows you to use as much or as little as you want and reduces waste. Using frozen fish and seafood can be up to 25% cheaper than fresh. Thanks to freezing technology, you can enjoy all types of fish and seafood regardless of the season and at affordable prices throughout the year. Frozen fish and seafood makes fish accessible to all. It offers improved nutritional benefits to everyone. Using frozen fish and seafood gives the caterer complete meal and menu flexibility. Frozen fish and seafood offers consistently high quality, year round price stability and a hugely extended shelf life – normally 18 months in a commercial freezer. Fish and seafood sourced in its most sustainable and natural environment and then frozen in the shortest possible time, ensures maximum freshness, and ultimately the highest quality for consumers. Buying frozen fish and seafood reduces the carbon footprint, because fresh exotic fish has to be flown into markets daily from all around the world. Fish and seafood is recommended as part of a nutritionally balanced diet. Freezing allows year round availability, and makes it easy to include as part of a healthy diet. Freezing stops all microbiological activity and this includes pathogens which cause food poisoning, and also spoilage. 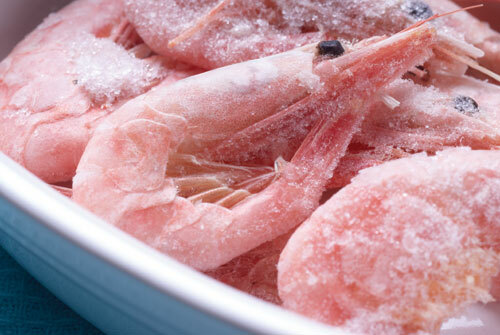 Frozen fish and seafood undergoes a high level of microbiological checks.